Mr Science Featured in itunes, originally uploaded by westius. This was a pleasant surprise. The Mr Science Show Podcast has risen to Number 10 in the itunes list of Science and Medicine Podcasts. Lets see if we can keep it there, and maybe crack the overall 100 - we can't be too far off! Thanks again for subscribing either through the podcast, web feed or email, and your support, emails and comments. Stephen Hawking is possibly the greatest physicist of the last century, and arguably one of the most influential ever. His list of achievements is enviable, and what makes them even more astounding is that many of his accomplishments have been achieved whilst he has suffered from a debilitating form of motor neuron disease. Amyotrophic Lateral Sclerosis (ALS) is a progressive and ultimately fatal neuromuscular disease, but despite enduring this difficulty, he has 184 scientific publications, including a best selling book A brief history of time. This week, we are going to look not at this man’s scientific achievements, but at some of the cool technologies he uses to communicate. Most people have heard Hawking’s distinctive computerised voice – he lost the ability to talk when he was forced to have a tracheostomy in 1985 following severe pneumonia. He communicates using a computer system with batteries based under his wheelchair, as because he is quite a busy man and always moving from place to place, it cannot be powered by direct connection to mains power. His computer can also be powered directly off his wheelchair motor battery. The screen is mounted on the arm of the wheelchair and is powered by a Centrino Pentium M 1.5GHz chip. The chair has an inbuilt wireless system that allows him to access the Internet throughout his home and office. In areas where wireless internet is not available, Intel manage a mobile phone account so that Hawking can dial in to the Cambridge server from anywhere in the world, via a Nokia laptop card phone. Initially, Hawking spelled out words letter by letter by raising his eyebrows when someone pointed to the right letter on a spelling card. This was a pretty tedious task. These days however, Hawking uses a program called Equalizer, written by Words Plus Inc to write and talk. A cursor moves across the top of the screen, which can be stopped by Hawking by pressing a switch in his hand. Words are printed on the bottom part of the screen, and when the cursor moves to an appropriate point, Hawking can press the switch and choose a word – in this way he selects words and creates sentences. Using this method, he can communicate about 15 words a minute. The computer can also be directly connected to a telephone socket to make phone calls. When his sentence is finalised, he sends it to a speech synthesizer built by Speech+, that creates the strange American accented computerised voice that we all know. He writes equations using a program called TEX, which translates his input into symbols, and prints them out. Using this technique, he also writes lectures, papers and books. Hawking can also operate his wheelchair by using an infrared ‘blink switch’ clipped onto his glasses. By scrunching up his right cheek, he is able to talk and compose his papers. That’s a very arduous task. Recently, Hawking has upgraded his computer to Windows XP, which was difficult as Equalizer was written many years before for the DOS operating system. However, Intel funded the upgrade to XP and the rewriting of the whole Words-Plus program. One of the other cool things that Hawking uses is a universally programmable infrared remote control connected directly to his computer system. This enables him to operate many of the electronic items in his home, such as televisions, DVD players and CD players. He can also open doors and operate lights throughout his house and workplace with the use of a radio-controlled device. Throughout the new Cambridge Centre for Mathematical Sciences, he will be able to get about the building virtually unaided. 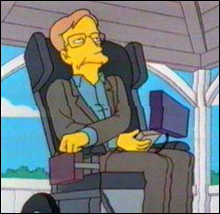 However possibly the coolest thing Hawking has done is be on The Simpsons, not just once, but a number of times. Check out Hawking’s homepage at www.hawking.org.uk for more information about his work and his disability. In the spirit of taking medical science into my own hands, and with a holiday to India and the Philippines coming up, I thought I’d take a look into vaccinations. A vaccination is the process of giving weakened or dead pathogens to a healthy person to give that person immunity against a related disease. A dose of the weakened infectious agent is called an immunogen. The immunogen primes the immune system in a process known as immunisation. When one or more immunogens are administered, this is known as a vaccination. The vaccinations I needed for my travels were for Cholera, Hepatitis A, Hepatitis B and Typhoid. To my surprise, thankfully a needle was not needed for the cholera vaccine. The vaccine is taken orally and does not taste too bad, and in further good news, protects against not only cholera, but also travellers’ diarrhoea. Cholera is an infection caused by the bacteria Vibrio Cholerae, that once having been ingested through contaminated water or food and in the intestine, the bacteria secretes a toxin that causes severe diarrhoea. It is most commonly found in Asia and South America, and is not seen as problem in more developed countries due to water treatment and chlorination. Travellers’ diarrhoea is caused by a variety of different bacteria, the most common being enterotoxigenic E. coli (ETEC). In the cholera vaccine, the cholera bacterium is modified such that the toxin-producing part of the bacteria is non-functional. This means that when it is administered, the symptoms of cholera do not develop. This allows the body to make antibodies against the real cholera bacteria so that if the bacteria do get into the body, it is immediately attacked by the body’s defence system. As the cholera toxin is very similar to the toxin produced by ETEC, the body’s defences against cholera will also work against the ETEC toxin. So whilst the vaccine against Cholera was reasonably painless, the Hepatitis vaccines came in the form of a needle. Hepatitis is a gastroenterological disease, often including inflammation of the liver. There are a number of causes of Hepatitis, and the two causes against which I was immunised were Hepatitis A and Hepatitis B. Hepatitis A is virus transmitted through contaminated food. It causes an acute form of hepatitis, however the infected person’s immune system makes antibodies that confer immunity against future infection. People with Hepatitis A are advised to rest, stay hydrated and avoid alcohol. A vaccine, like the one I had, is available that will prevent infection from Hepatitis A for life. It has no chronic stage, and so is not as dangerous as Hepatitis B. Hepatitis B can cause both acute and chronic Hepatitis, and is spread through bodily fluids. One of the dangers of Hepatitis B is that the infection establishes itself in the DNA of the affected liver cells. This makes it hard to defeat once you’ve got it. The vaccine prevents infection from Hepatitis B for life. However, Hepatitis B infections result in up to 1.2 million deaths per year worldwide. The fourth and final vaccination I needed was against Typhoid fever. Typhoid fever is an illness caused by the bacteria Salmonella Typhi and is transmitted by ingestion of food or water contaminated with faeces from an infected person. The bacteria then multiply in the blood stream and are absorbed into the digestive tract. Typhoid fever can be fatal, and adding to the danger is that it can be spread by flying insects that have dined on infected faeces. However, it is mostly spread through poor hygiene. Symptoms most often include a fever, chills, a slow heart rate, weakness, diarrhoea, headaches, muscle pain, lack of appetite, constipation and stomach pains. It is thought that a devastating plague of typhoid fever killed one third of the population of Athens, including their leader Pericles, in 430 BC. And just to make this simple holiday seem a little more dangerous, I’m taking some antibiotics along just in case I come across malaria, an infectious disease that kills over 1 million people each year. And I thought travelling would be safe. This week on Mr Science, I’m taking medical science into my own hands and giving Vacuum Cupping a road test. Vacuum Cupping is a form of Traditional Chinese Medicine and is a way of applying acupressure to the skin. A vacuum is created next to the surface of the skin in a plastic or glass cup, which is held to the skin by the vacuum. Sometimes this is called Fire cupping as a fire will often be lit next to or inside the cup, which causes the air inside the cup to heat up. The cup is then placed upon the skin, where as it cools, the air inside contracts, and causes the cup to stick to the skin. In the version of Vacuum Cupping that I had, modern technology had caught up with Traditional Chinese Medicine, and the air was simply extracted from the cup with a pump. Cupping is used in the treatment of respiratory diseases such as the common cold, pneumonia, and bronchitis. Cupping is also used to treat back, neck and shoulder pain – I used it in the hope that it could treat my ongoing shoulder and neck distress. This technique, in varying forms, has also been found in the traditional medicine of Vietnam, the Balkans and Greece. Suction cups placed at various acupuncture points on the body create a vacuum that apparently draws toxins and fluids to the surface of the skin and brings about relief by rebalancing yin, yang and qi. It is claimed that is also loosens adhesions and lifts connective tissue, and brings blood flow to stagnant muscles and skin. There is no scientific consensus over whether such methods work beyond the effects of a placebo, so I thought I would try it out for myself. Acupressure has been show to work in reducing nausea – this can be achieved through the use of an acupressure wristband. Massage has also been shown to provide some long-term benefit for lower back pain. If it’s good enough for Gwyneth Paltrow and the Australian swimming team, then it’s good enough for me. The experience was an interesting one. The massages before and after the cupping were excellent, and certainly made me feel relaxed. Indeed, I fell asleep. However, the cupping process itself was a little odd. My skin felt quite tingly as it was sucked into the cup, and now two days on, is quite bruised. Around 12 cups were placed on my back, from my lower back, up to my neck. After the cupping was complete, I had 12 red circular marks on my back, with the two lower one’s being quite dark red. This, I was told by the lady who ran the clinic, was because I had some lower back issues – and I did feel better after the process was complete, but I do not know whether it was due to the massage or the cupping. The lower back cups were also placed quite close to the liver, which I had given a fair working out at a party the night before, and this may explain why that part of me was a little tender. Most of the marks are fading, except for the two highest ones on my neck. This has prompted people to think that I have some strange hickies. It is perhaps not surprising that they have not faded as my neck has given me many problems over the last 6 months – perhaps the blood flow to that region is not very good and so it is not clearing up as quickly as other sections of my back – but this is just my speculation, and I’m not a medical scientist. So it would seem that the jury is still out on Vacuum Cupping. I would encourage everyone to try it out and form their own opinions – that’s what science is about, lots of people conducting the experiment in many different ways. I found it a very relaxing, yet intriguing, experience. Recent studies have found that acupressure can help reduce nausea, and pressure points on the head can be massaged to reduce headache. Some of these studies suggest that applying pressure to certain points on the body causes the brain to release endorphins, small proteins that act as a natural painkiller. For me, I really enjoyed the massage and might give it another go when the bruises fade. We’ve all watched films and thought, "that’s impossible" or "that’s unbelievable". Sometimes movies take liberties with science, allowing things to happen that in real life are impossible, or at least unknown. Today we are going to have a look at three of my favourite science fiction films and see whether or not some of the astounding things that happen in them have any scientific basis. One of the most popular science fiction films of recent years is The Matrix, in which Keanu Reeves discovers that artificial intelligence has trapped human kind in a virtual world and is using it as a power source. There are so many interesting and baffling scientific and ethical questions raised in this film that there are thousands of Internet pages and chatrooms devoted to the topic. One of the scientific problems with the film is the notion that the machines are using humans as a power source. Morpheus says to Neo that the human race is enslaved in a power station, where it is used as a source of bioelectricity. This is, unfortunately, rubbish as it violates the law of conservation of energy. This is because humans need to eat to stay alive, and the conservation of energy law states that the amount of energy that comes out from the humans can not be greater than what is taken in, making the power station ludicrously inefficient. Also, in Morpheus’s speech to Neo, he states that the machines have discovered a new form of nuclear fusion – obviously their actual source of energy, and not the humans. However, this in itself provides hope for those who believe in the Matrix universe. Controlling the fusion reaction is a difficult process that requires computer control. One theory suggests that hooking up millions of human brains creates an outstanding parallel computing system that can act as an immense distributed processor for controlling the nuclear reactions. The movie Contact sees Dr Ellie Arrow, played by Jodie Foster, searching the heavens for electromagnetic signs of extraterrestrial life using radio telescopes, eventually finding a signal and using that signal to build an immense machine that transports her, through a worm-hole, to the Vega star system where she speaks with an alien and then comes home. The movie is based on the novel by Dr Carl Sagan, an American astronomer, astrobiologist, and highly successful science communicator. There are many people in the world today doing as Dr Arrow did in the film and search the sky for signs of intelligent life – where the movie takes a leap is that in real life, we have yet to find any. You can even sign up to SETI at home and donate some of your computing power to analysing signals that come in from radio telescopes around the world. Sagan wanted to make his novel as close to scientifically accurate as possible – obviously difficult to do when dealing with such mind-blowing topics – so he contacted the world’s foremost black hole expert, Kip Thorne of Caltech. Thorne and associates were able to postulate a theoretical set-up for a transversable wormhole using “exotic matter.” To be stable, wormholes need lots of what’s called negative energy. Quantum mechanics suggests that it exists, but we haven’t found it yet, and we don't know whether the laws of quantum mechanics allow enough negative energy to be concentrated to allow wormholes to exist. One possible location for wormholes is at the centre of black holes. Travelling through one of these might prove extremely difficult however, since the wormhole would be so unstable that it would collapse as soon as a spaceship (or even a ray of light) entered it. This is because there would not be enough negative energy to hold it open. In Jurassic Park, Richard Attenborough and researchers find fossilised mosquitos that had bitten living dinosaurs. Soon after, these insects were caught in oozing tree sap that fossilised into amber. The scientists extracted the dinosaur blood from the fossilised insects and used the DNA in the blood to recreate dinosaurs. Does amber old enough exist? Not from the Dominican Republic, where the sap in the film is from. The amber from this island is between twenty and forty million years old, far too young for the last dinosaur who existed sixty five million years ago. There are however, a number of sites around the world where amber old enough can be found. But even if it exists, can we extract DNA from an insect trapped inside? Unfortunately it appears to be virtually impossible to extract sufficient DNA to recreate a dinosaur genome. Research has shown that the DNA of dead organisms begins to fragment very rapidly unless it has been preserved under unique conditions. If a piece of amber were found containing an insect full of dinosaur blood, the blood cells would have to be separated from the insect’s cells, difficult in itself. Next, scientists could use a technique called polymerase chain reaction (PCR) to replicate the DNA enough times to work with it. But since DNA deteriorates over time, very little of the complete genome would be left. The genome of a dinosaur is made up of billions of nucleic acids, and we may be only able to string together two or three hundred of them, or less than one millionth of the genome. This gives us no clue as to the rest of the genome or how it all goes together. But don’t give up on movie science just yet. I’m interested in seeing how the new Spiderman movie deals with Spiderman’s special new powers that he gets from the moon, and how the villains get their powers. My lovely cousins drew some pictures of me, and I'm not totally sure what to make of them. Angus thinks that Mr Science is "the graetest man in the world", and that red thing on the right hand side is the paparazzi taking a photo of me. I also have winged feet, which is frankly pretty cool. However, I am slightly disturbed by what Maddy thinks of me. It is a nice outfit though, I do like the boots.